I understand that this conversion kit is designed to work on FACTORY STOCK XDM pistols. Lock Open Disclaimer Every effort was made to incorporate our last round lock open feature into the XD family of pistols. Due to the XD spring design, we cannot guaranty this feature will function consistently. The front and rear sights are removable. The rear sight is adjustable for both windage and elevation. It is a Glock style adjustable rear sight and screw on front sight. Springfield incorporated an internal firing pin safety into their guns. We thought it was important enough to include it on our conversion kits as well. Our internal firing pin safety is designed to eliminate accidental discharges from dropping the firearm. 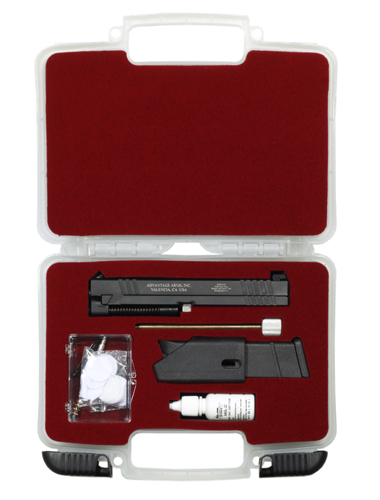 Installation is simple and does not require any modifications to your XDM pistol. Simply remove the XDM magazine and slide as outlined in your owner's manual. Now slide the "Advantage Arms" slide onto the frame, rotate the disassembly lever into the locked position. Insert the conversion magazine. You are now ready to shoot. Our XD Conversion Kits are made to work on FACTORY STOCK XDM frames. Note: Aftermarket parts such as trigger bars or trigger jobs can adversely affect the function and reliability of your conversion kit. We highly recommend CCI 40 grain round nose ammo for the best shooting experience..